Damianita is a Texas Native near the Edward’s Plateau that likes the hot conditions and poor soils of our area. It is a shrubby evergreen plant with a low mounding growth habit with leaves that are needle-like and very aromatic making it deer and rabbit resistant. 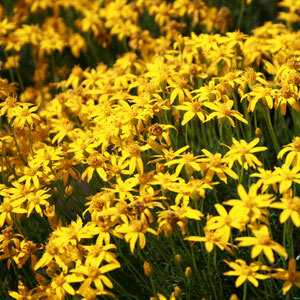 Chrysactinia mexicana will be covered in 1” yellow daisy type flowers year round, and will only reach 1-2’ tall with a 2’ spread making it a good border plant for dry locations. Prune lightly because it could die when pruned to close. Damianita takes reflective heat and light well and makes a wonderful plant for wall plantings. Like most native plants it will need to be planted in a well drained area.